We align them next to each other to form words and arrange those words together to form sentences. When we put a pen to paper those sentences become letters of a different sort, a lost art in today’s world where our thoughts are often relegated to emails and texts. Convenient, yes, and definitely a more immediate and frequent method of communication but what we’ve lost is the letter in hand, and the future rereading of those thoughts. My mother was the consummate letter writer. When she was a girl she used to visit cousins who lived on Clifford Road in Deer Park, Ohio. Her future boyfriend lived next door. As they grew to be teenagers and started dating, the distance that separated her home from his proved to be daunting. My dad didn’t have a car and his family didn’t have a phone. 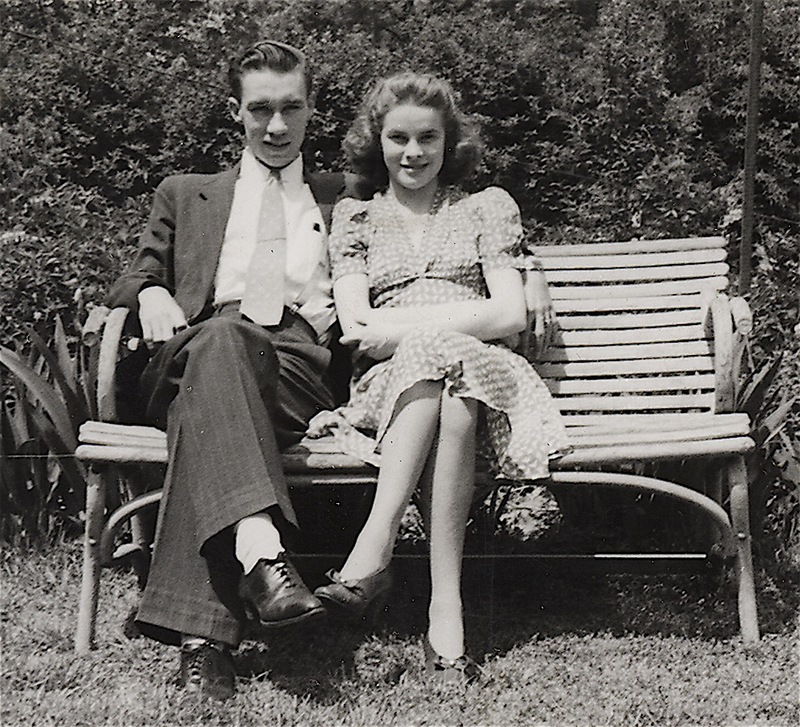 Once or twice a week he’d take a bus or walk to see her and in-between those visits they’d write to each other. When I was a teenager, they shared those letters with me. The letters could be paired up….his answering hers answering his. I don’t remember the exact circumstances of why it was decided the time was right for me to read them but I suspect it was because I was rebelling against what I perceived to be my parent’s overprotective ways. Instead of sitting me down and trying to explain why they were concerned about my safety all the time they let me read, in their own words, what life and been like for my dad when he was a teenager. He once told me that when he was dating my mother he thought she was the most beautiful woman in the world and he just couldn’t believe she loved him. When it was time to go to her Junior Prom, Mom told Dad he would need to learn how to dance before he could be her date. He refused and she went without him. During the following year his letters were full of his attempts at learning to dance. His older sister, Lorraine, was teaching him and he was happy about the upcoming event. Then, included among the letters was the death notice for his 19-year-old sister, who had been killed in a taxi cab when it was hit by a train. I’m not sure he ever learned to dance but Mom did take him to her Senior Prom. 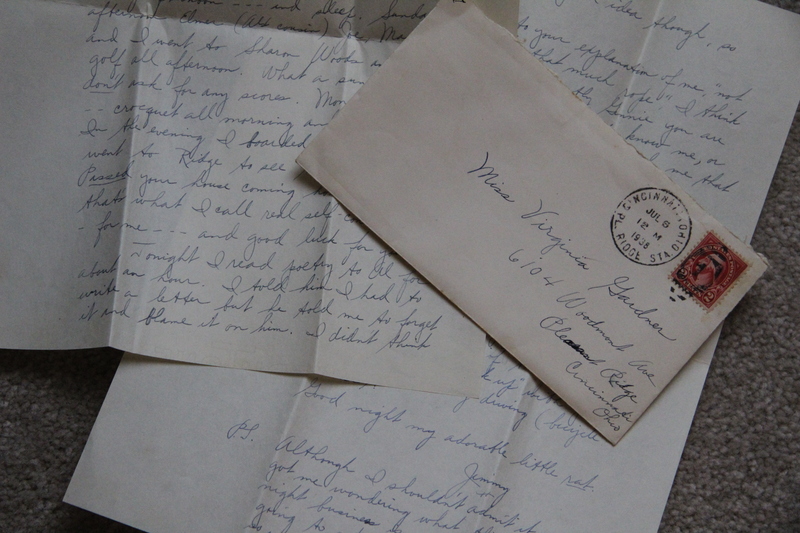 Six months later the letters spoke of his mother’s suicide and how Lorraine’s death had been too much for her already troubled spirit to handle. I was a late in life baby. I had always thought of my parent’s as being older, never once stopping to consider that they’d once been my age, with the same thoughts, dreams and insecurities that I was experiencing. 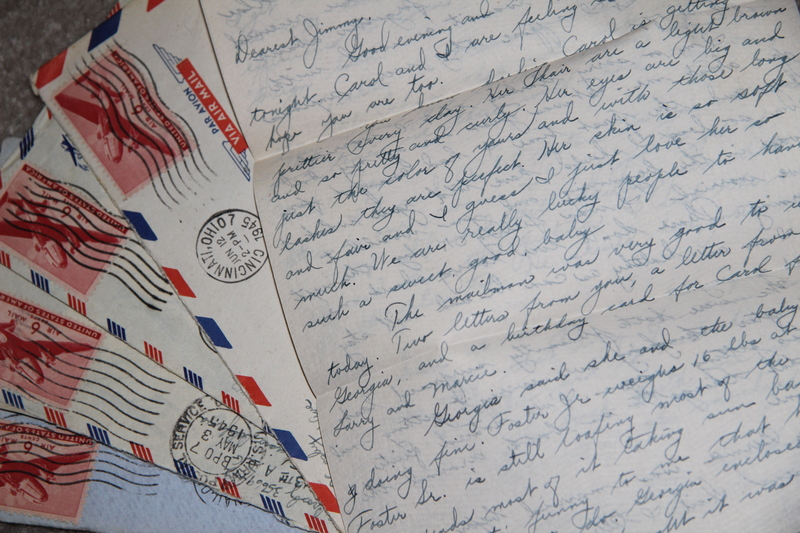 Their letters gave voice to their once teenaged selves. Although I still balked at their protectiveness, I at least came to an understanding about it in a way that no lecture could have ever reached me. The letters didn’t stop after they said their wedding vows because my father soon went off to war. They had a young daughter by then and letters were the tenuous threads that stitched their lives together. It took weeks for their thoughts to reach each other. Often the letters crisscrossed. Across the continents each letter was read and carefully saved. Today they can also be matched up chronologically and once again we are able to follow the lives of a young couple separated by distance while they longed to be together. There were hundreds of letters written during this time. Those letters gave voices to the longings, the concerns and the love of a young couple separated this time, not by a mere miles, but by oceans. Fast forward to a time when that young daughter, my oldest sister, leaves home to go to high school at a convent in another state. My mother once again takes up her pen and begins writing to Carol every week, attempting to bridge the distance for her and for her daughter, through a series of letters recounting life at home. Mom wrote every single week, without fail. And it doesn’t stop with Carol because one day I load my car and drive away from home to join my husband in a very distant state as he starts his military career. My mother simply starts writing two letters every week instead of one. One goes to Carol and one goes to me, finding me in whatever state I happen to be living in at the time. The first letter is dated May 28, 1980 and they continued for more than twenty years until arthritic fingers forced her to stop writing. I have every one of those letters and now that my parents have passed, the ones I wrote back to her every week, saved in a shoebox in her closet, can now be paired with the ones she wrote to me, also carefully saved. Today I communicate with my sons and their families via numerous texts, phone calls, messages on Facebook and by Skyping or FaceTiming them regularly. When my first grandson was barely two he’d pat the laptop and say “Juju” or “Lolo” when he wanted to see us. I’m pretty sure he thought we lived in that computer and I love that he knows us so intimately even though we don’t live in the same town. However, decades from now he won’t have in his possession the words in the letters that will give voice to who we once were. Letters are a lost art form for the majority of us but I like to imagine that someday my children or grandchildren will sit down and read this blog to hear my voice, just as I spent this afternoon reading past letters and have a head now filled with the voices of my parents. I’m grateful to have the letters they left behind.